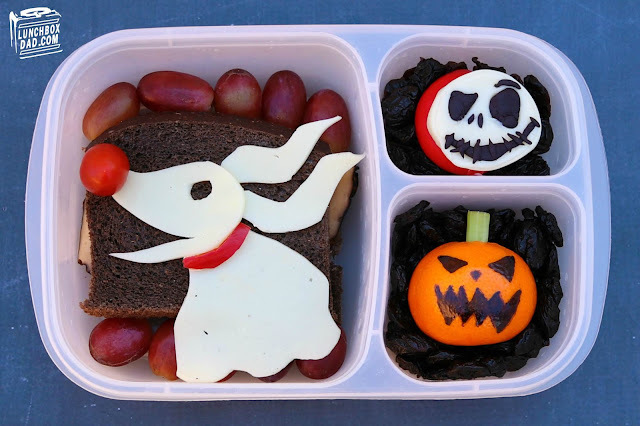 So I figured, "It's Halloween, why not make another The Nightmare Before Christmas Lunch?" I know I made one last week but it is just far and away the best Halloween/Christmas movie out there. My kids love it. I love it. Why not? So I thought I would take a bit of a different angle and feature Zero the dog in this one. After all, he might be the unsung hero of the movie. We actually still haven't watched the film yet this season but it will definitely happen. In the meantime, there are always more lunches to be made! 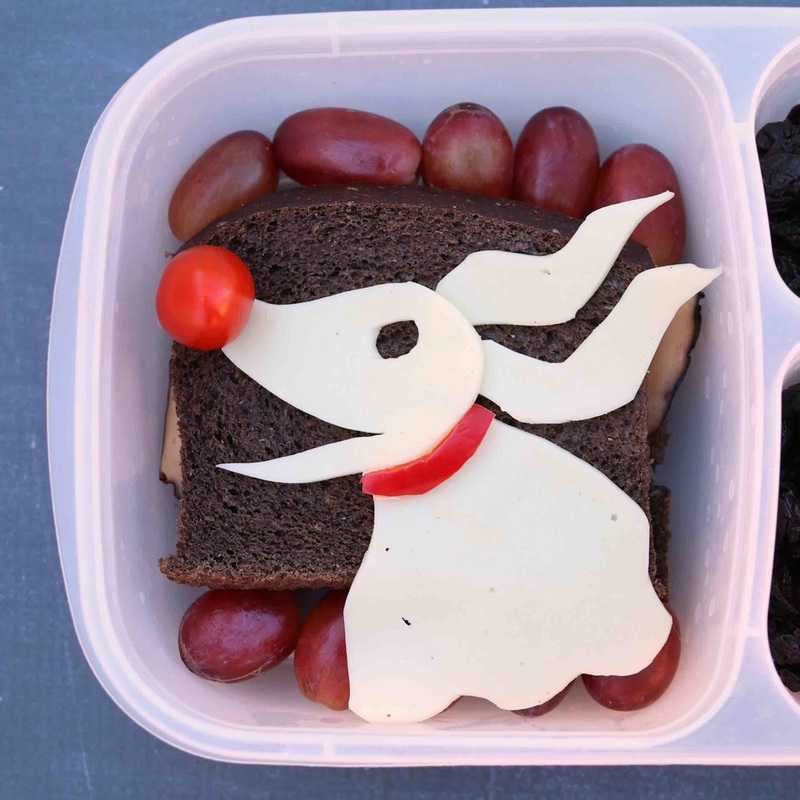 I created this lunch in an Easy Lunch Boxes container. I also used Pumpernickel bread but you can use any dark wheat. 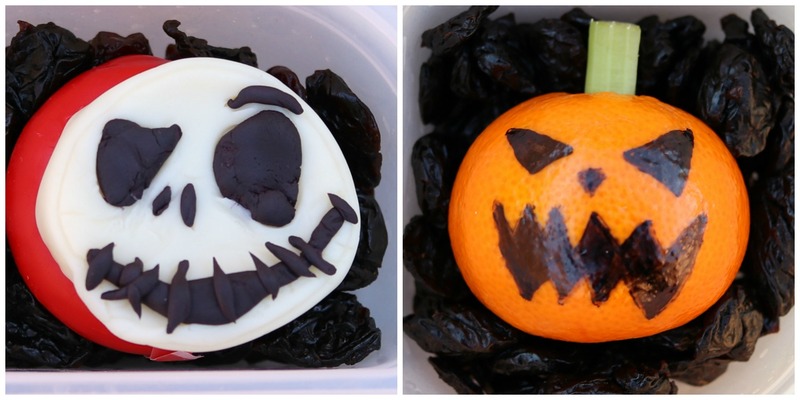 I also had a silicone mold that containers a number of expressions for Jack Skellington. I have had it for almost a year but haven't used it. I figured it was about time. This is how I made Jack's face using white and black edible modeling dough. The rest of the directions are below! 1. Place turkey inside two slices of bread and put in main compartment. Surround with red grapes. Cut provolone cheese into Zero's head. Then use scraps to cut out his ears. Last, use a second slice to make his body. Assemble pieces on top of the sandwich. 2. Cut a small slice of red sweet pepper. Place under head for his collar. You can paste on using cream cheese. Attach grape tomato to nose using toothpick. 3. Place Jack's head, made from edible modeling dough, on top of red Babybel Cheese round. Put in side compartment. 4. Draw Jack O' Lantern face on mandarin orange. It should look scary to fit in with the theme. Make an X cut in the top and push a small piece of celery through the cut. Put in other side compartment. 5. Surround both Jack's head and pumpkin with dried cherries.